I teach at a Title 1 school and have 21 students in my kindergarten classroom. My students speak six different languages, and 95 percent of them are English language learners (ELLs). My approach to teaching is "relationships first." I teach students, not curriculum, and I believe in creating high-quality lessons and curriculum and delivering that material in a FUN and engaging way! I have high expectations for my students and encourage risk-taking, exploration and fun! When it comes to technology, the kids use iPads, laptops and Kindle Fires, as well as our Smart Board. For about two years now, we have used the augmented reality platforms, Letters alive and Math alive, and they have been a huge success in our classroom. A couple of months ago, we took things to the next level and started using the Sprout Pro G2 Learning alive Station. 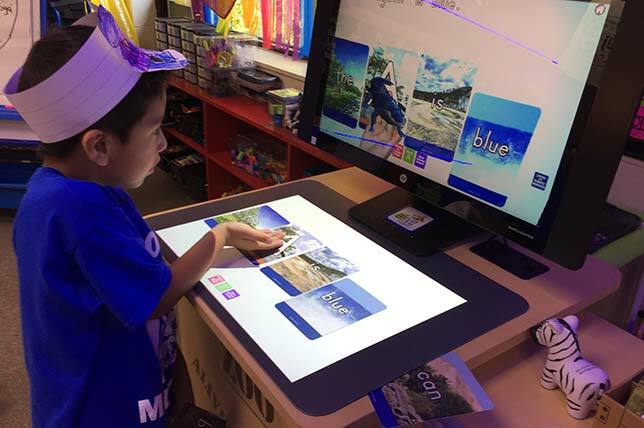 The station combines the 3D augmented reality cards of Letters alive and Math alive with the Sprout's built-in high-res document camera and 20-point Touch Mat to give my students a highly interactive, cross-curricular 3D experience. One of our favorite things to do is build words with Letters alive. I'll say a word and students find the letter cards and spell the word. Then they push the button to hear the sounds and the word. This provides them with scaffolded practice with phoneme segmentation and blending their sounds into words. Once the students are familiar with this activity, it actually becomes an independent learning center that my students do on their own. They use picture cards and build the words on the card using Letters alive, and then write the word. This gives them a multi-modality approach to word work! For our classroom, this ability for students to use the technology is vital because it's their classroom and their technology and their learning, and I want my students to have access to everything in their classroom! The results are clear, too. At the end of ABC BOOTCAMP we have an average of 90% mastery of all letters and sounds. When using Learning alive as a supplement to our ABC BOOTCAMP curriculum, we've seen literacy scores improve—and the laughter and squeals of excitement are sure signs of the learning and engagement happening! Greg Smedley-Warren is a kindergarten teacher, curriculum developer, speaker and the creator of the blog The Kindergarten Smorgasbord. Follow him on Twitter: @kindersmorgie.